Doodle Rock Rescue is seeking volunteers from the Dallas design community. Social media isn’t always, like, the coolest place. At times, it can truly be a bottomless black hole of despair and self-loathing. But sometimes, it can be a wonderful thing. Case in point: a post (below) by Leigh Owen Sendra on the Park Cities Resale Shop group on Facebook, spotted by D Home’s Editorial and Creative Director (and animal-lover), Jamie Laubhan-Oliver. To sum it up, last March, Sendra founded Doodle Rock Rescue, a non-profit organization that rehabilitates and re-homes Dallas doodles in need. This year, she secured a physical building to be turned into a nonprofit vet clinic run by volunteers. Sendra turned to Park Cities Resale Shop, a Facebook group predominately used for clearing out closets and “ISO” (in search of) inquiries, to find a team to help her build out the space, and connected with architect Gianna Glaesmann, who offered to donate her services. Sendra is currently still hoping to find builders, roofers, plumbers, and more interested in donating their time to lower the costs of renovating the clinic. So now we’re spreading the word to you, dog-loving Dallas design community. 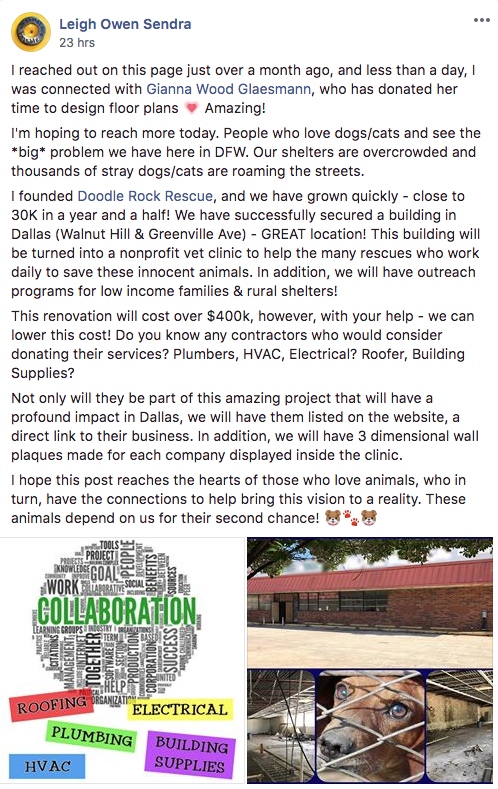 Designers, builders, and more, if you have any leftover supplies or can even donate your time, now is your chance to help bring Doodle Rock Rescue to life, and help positively impact animal rescue efforts in the Dallas area — the perfect feel-good opportunity to use your gifts for good.